With Halloween a week away, we wanted to put together a delicious treat that’s perfect to take along to parties! It’s remarkably simple to put together, but it tastes like you spent hours in the kitchen. 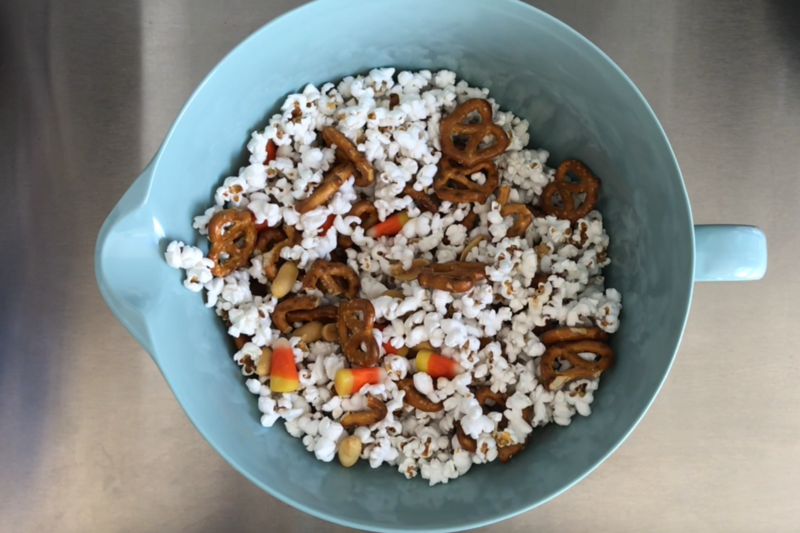 In a large bowl, combine the popcorn, pretzels, peanuts, and candy corn. Set aside. In a small saucepan, combine the honey, sugar, salt, peanut butter, and 2 tablespoons of butter. Bring to a boil while stirring continuously. Let boil for about 2-3 minutes. Pour over popcorn mixture, and stir to combine. On a cookie sheet lined with parchment, spread out the popcorn mixture into one layer. Break up any large chunks. Using a double boiler (or a bowl over a small saucepan of boiling water) melt the peanut butter chips while stirring continuously. Depending on the brand you use, you may need to add a few tablespoons (or more) of butter to keep a liquid consistency. Pour melted peanut butter chips over the popcorn mixture. Let cool for about an hour.